Do you think corporate fixed deposits are as safe as bank Fixed Deposits? Has come agent convinced you that you will get 2-3% higher returns from corporate fixed deposits without any risk? If thats the case, you need to be educated a little more about corporate fixed deposits. I will talk about 5 major things every investor should know before they put their hard earned money in corporate fixed deposits. What are Corporate Fixed Deposits? Corporate Fixed Deposits are deposits which are issued by private and public companies, which work very much like bank fixed deposits. There is an interest rate offered and there is a maturity duration for the company deposit. You can either opt for cumulative option (where your interest is added in deposits) or you can opt for non-cumulative option, where you are paid the interest after every fixed duration. A lot of agents get a good commission for selling these corporate fixed deposits to their clients. Nothing bad in that as such, but you need to be clear about some important and critical points related to company fixed deposits. In almost all the cases, the corporate fixed deposits offer quite higher returns compared to a bank deposit. If bank deposits rates are 7% , you will see that company deposits floating in markets are providing your returns in range of 8-14% .. The logic is very simple, a company needs money for expansion or for some project and to fund that project, they can either take a loan from bank or raise money from other measures and for that they will have to pay very high interest. So they float a corporate fixed deposits where normal investors like you and me can invest in their deposits and earn higher returns. But, because you get higher returns, there is also high risk involved in corporate deposits. You never know how the company will do in next few months or years. You never know how the project of a company turns out and if its going to make a profit or loss. In short, after few years, when its time for maturity – what will happen if the company financial health is not good? Will they repay the money on time? Will they repay the money at all? A lot of senior citizens are lured into parking their hard earned money into many shaddy fixed deposits offered by small or medium sized company fixed deposits by showing them high returns. Below is a heart breaking case study of a 78 yr old person who had put all his graturity and PF money into DSK Kulkarni FD (a very big real estate group in Maharashtra). When his FD maturity came, he was told that he should renew it for another 6 months as its tough to repay right now. The video below is in Marathi, but you will understand some words and will be able to make out what is being said ! So please understand that when you are investing in a corporate fixed deposits, there are good chances that if its offering very high returns, there is a lot of risk involved in that. You cant get higher return just like that. Many big companies also offer corporate fixed deposit, but then the interest offered is quite lower and looks reasonable. However the risk is still there unlike a bank FD . 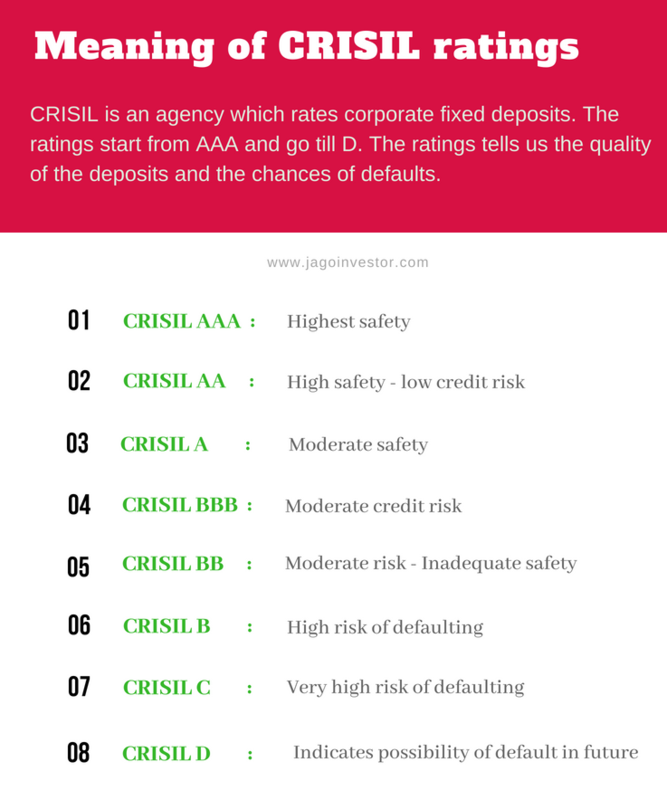 Every company fixed deposits are rated by agencies like ICRA, Crisil, CARE etc and they give a rating to the FD. These ratings are a measure of the company’s ability to pay the interest as well as principal to its investors. A high rating means no or very low probability of default. Note that unlike bank fixed deposits, corporate fixed deposits are not regulated directly by RBI regulations. All the deposits under corporate deposits are governed by provisions of 73 to 76A of the Companies Act 2013 (erstwhile section 58-A of The Companies Act 1956). If the company is not paying your on time, you cant do much in that other than following up with the company. However, Fixed Deposits of Corporates are secured borrowing, so in case of winding up of business, secured borrowings are given preference over equity shareholders in terms of repayment. Still want to invest in Corporate Fixed Deposit? If you still want to go ahead and invest in a company fixed deposits, please take care of following points. Let us know if you liked the article? Thanks for your great insights on corporate FD’s & also informing about the CRISIL rating. Thanks for your comment Jay Mehta .. Please keep sharing your views like this.. I Need to focus on my deposits as I am super weak in investments. Thanks for your comment StatusXP .. Please keep sharing your views like this.. Very useful and interesting articles. Thanks for your comment Akhil .. Please keep sharing your views like this.. Thanks for this amazing blog, just like your other blogs. My Dad (Retired) is now a days interested in Company Deposits. He has invested in a few of them to the tune of 2-3 Lakhs. This is really very knowledge sharing platform and I really appreciate your efforts @Team JagoInvestor. Thanks for your comment Ronak Shah .. Please keep sharing your views like this..